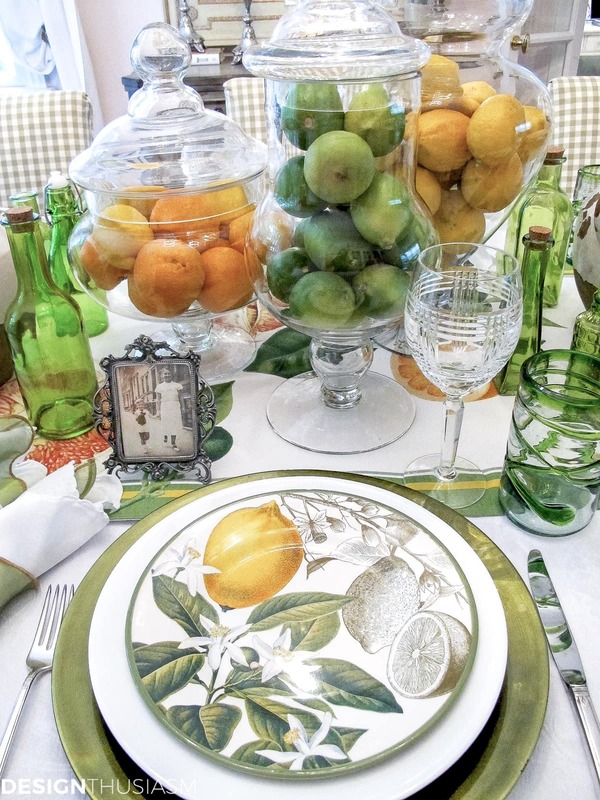 In this post: For a celebration that’s both festive and sentimental, consider Father’s Day decorations utilizing citrus imagery and vintage photographs. If there’s one thing that says summer to me, it’s citrus fruits. So when it comes to Father’s Day decorations I love to combine all three! We often celebrate Father’s Day at home and while hubby does the grilling , I like to set a table that honors the occasion. 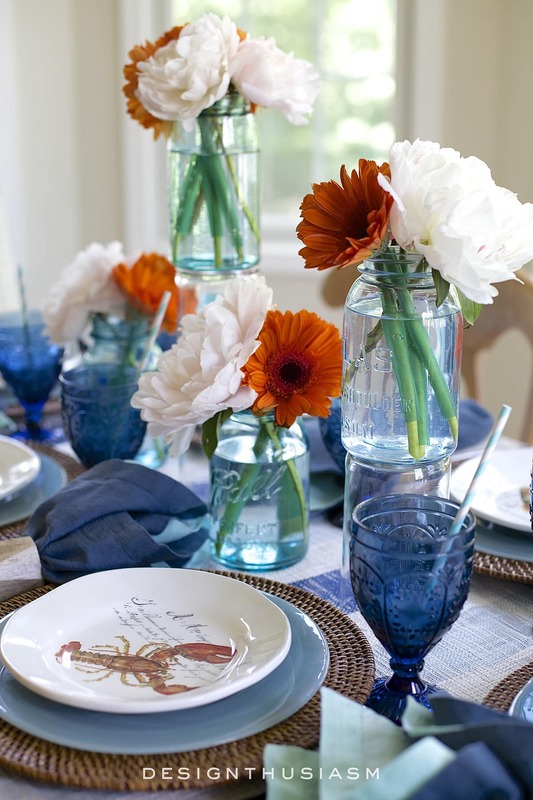 I like my Father’s Day table setting to reflect the sunny feeling of time spent with family. 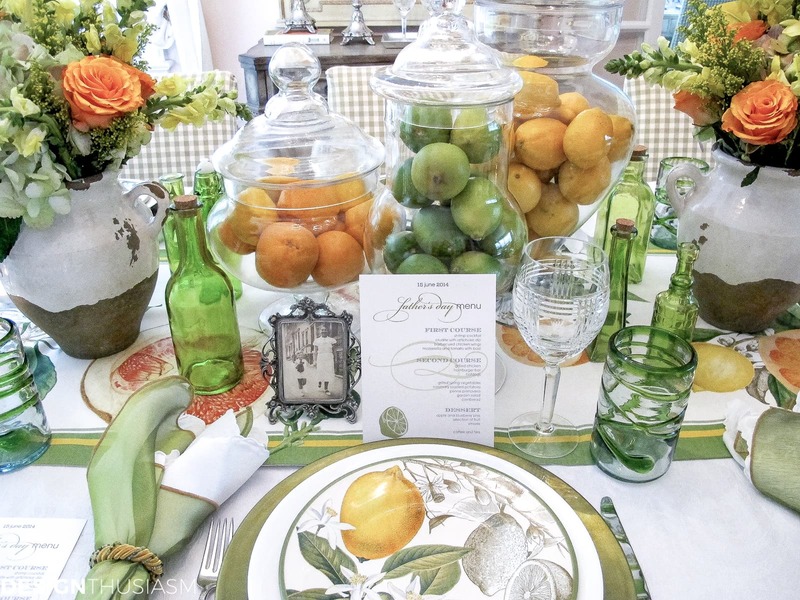 For this tablescape, I settled on a citrus theme and revolved the look around botanical citrus salad plates played off of a centerpiece composed of lemons, limes and clementines presented in oversized apothecary jars. 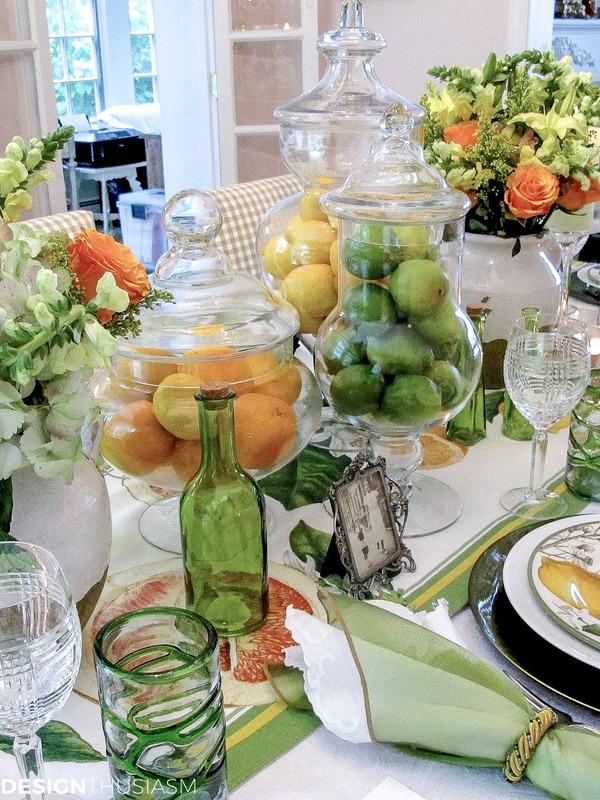 Chargers, napkins and assorted green glass bottles highlight the lime, while the floral arrangements celebrate the entire citrus palette. 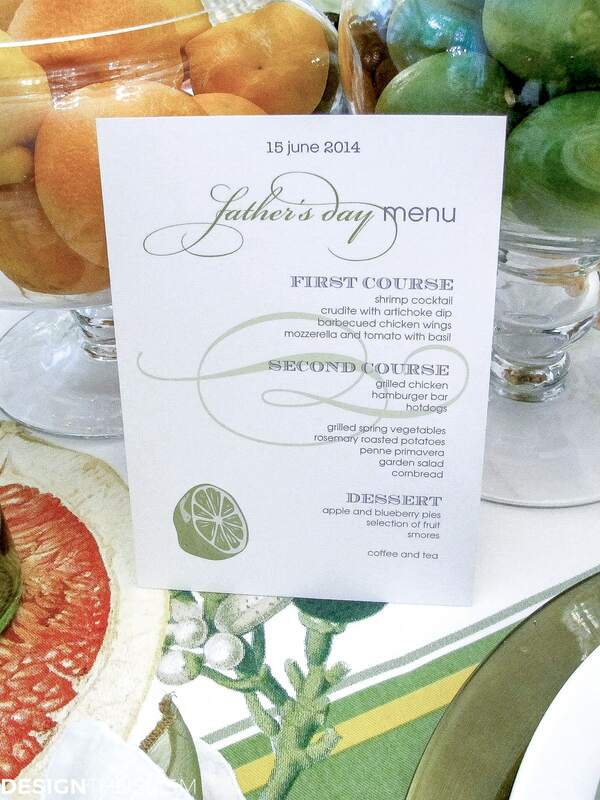 The menu is my own design and plays into the same citrus theme. 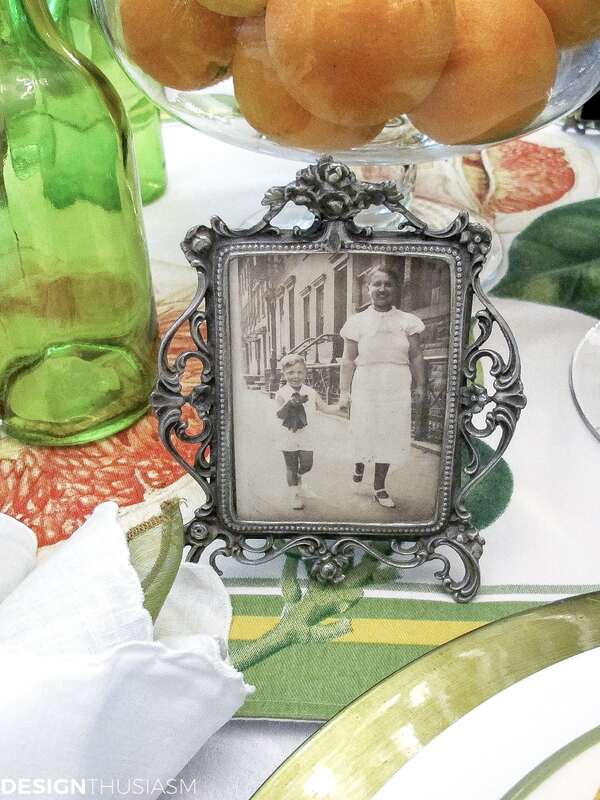 The most poignant elements on the table are the vintage photos of all the dads in the family. This photo is of my dad with his mom, in a lovely antique frame. A closer view of the plates reveals a peak at the coordinating table runner, as well. 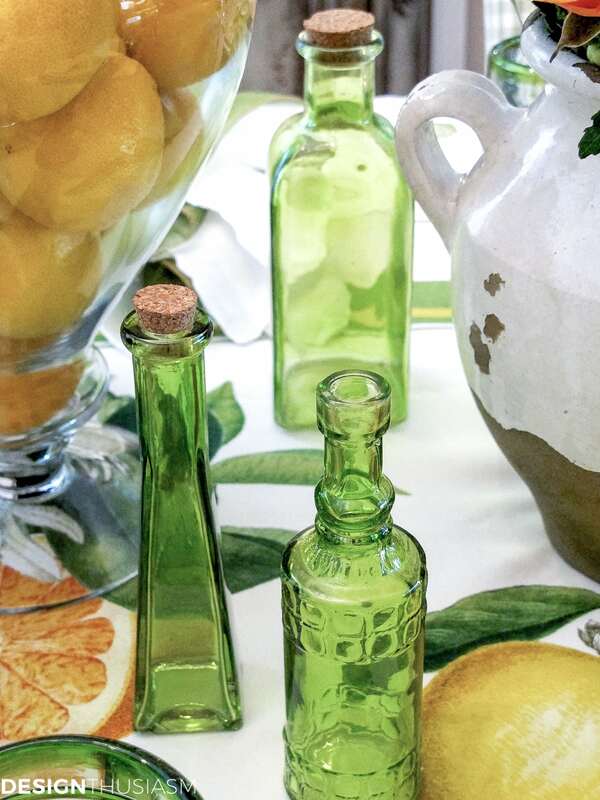 The green glass bottles in assorted shapes and sizes are a fun decorative touch to add to the mix. 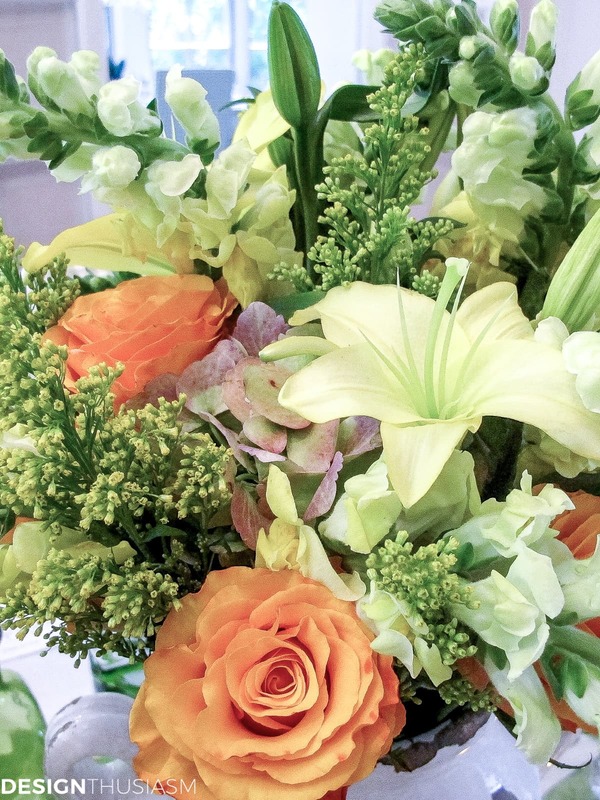 Roses, snapdragons, hydrangea and lilies bring the color on the table to life. 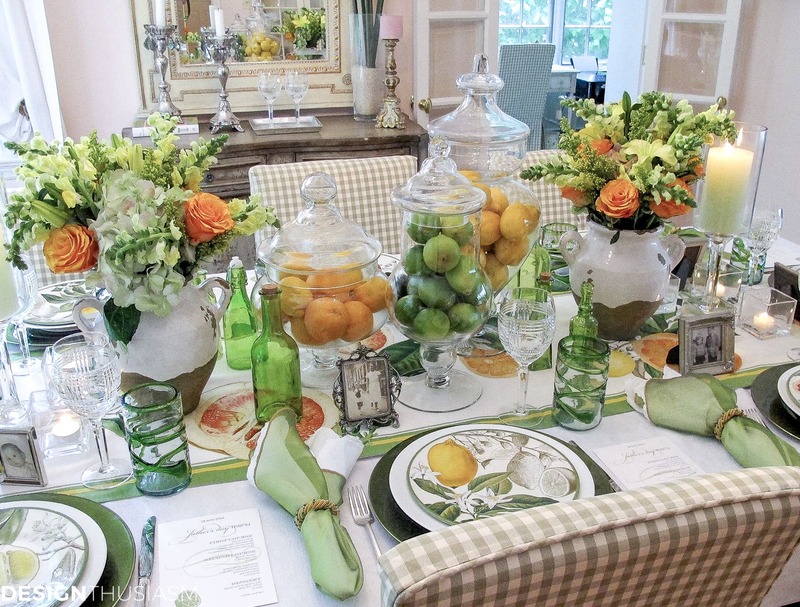 Clementines, limes and lemons in apothecary jars are the foundation of the theme. 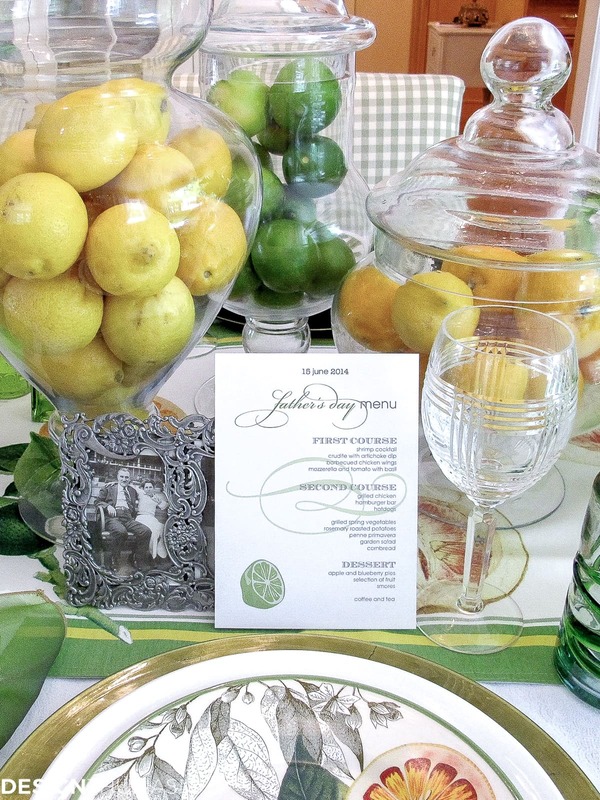 I love to use original graphics in my table decor, sometimes on menus or table cards. The sunny feeling fills the entire room. Thanks for sharing this on the Rustic & Refined linking party – or I probably would have missed one of the prettiest tables I have seen in a long time!! I love the color pallet and the beautiful setting. The flowers and photos are just gorgeous! 100% beautiful! 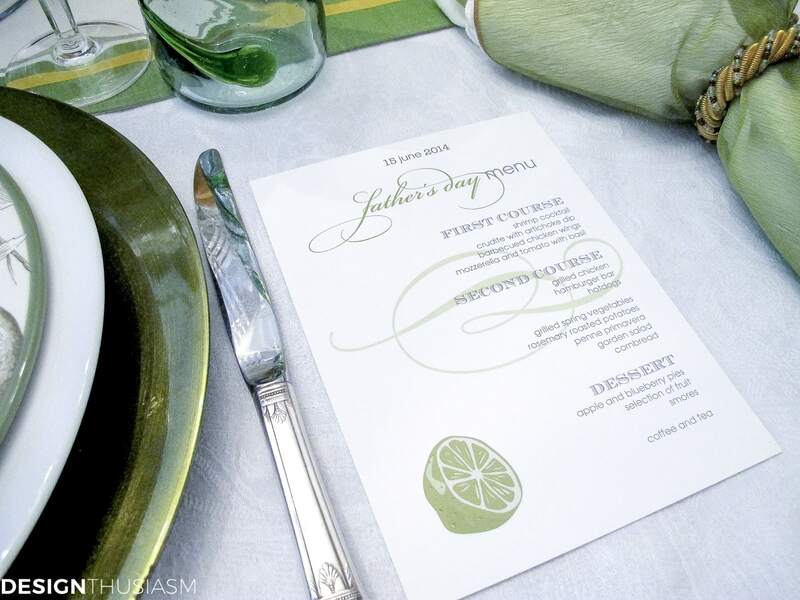 I am really blown away by the details you brought to this beautiful tablescape to honor Dads. The menu is absolutely gorgeous! I like to create menus, too, and I’m super impressed by yours. I love how the motif ties into the theme. Your florals are stupendous!!! 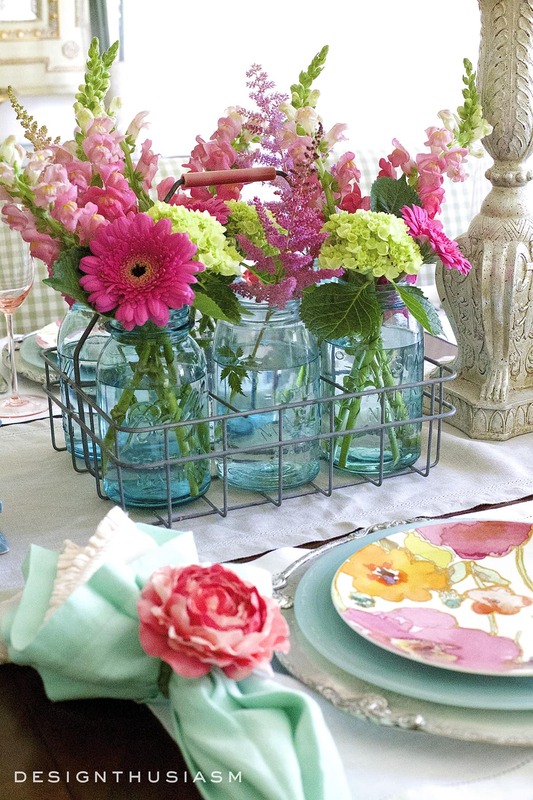 I just love fresh flowers galore, and this table has them!!! Between the roses and the lilies, I’m sure the fragrance was just heavenly! FUN use of the photos on the table, too!!! The botanical plates are so cool. I love, love, love Williams-Sonoma!!! They can do no wrong when it comes to home fashion!!! OMG! Such a beautiful table Lory! I covet the WS dishes 🙂 Such a special table set for such special men! Oh how nice- love the florals and the pictures you included. 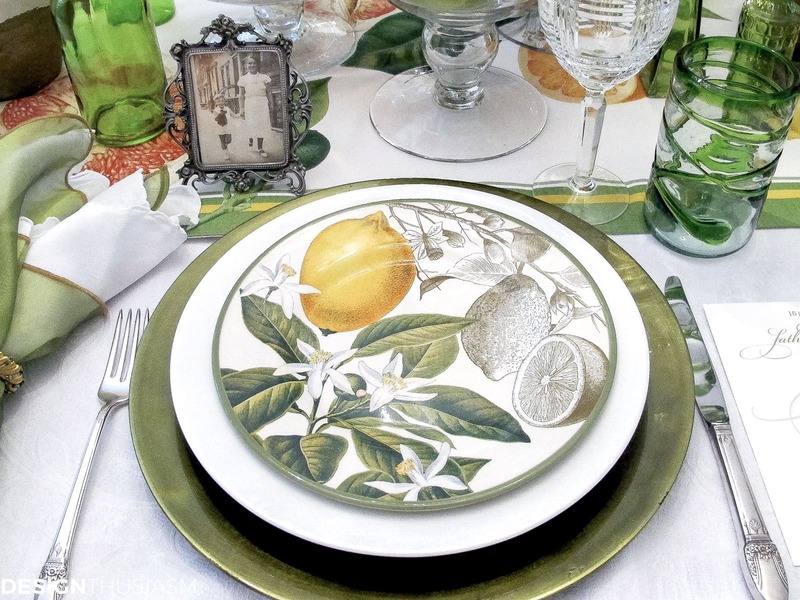 Love all the cheerful colors in this table- especially the lemons and the Williams Sonomoa dishes! This table is so fresh and is just perfect for summer! Thanks Jocelyn! Thanks for visiting. 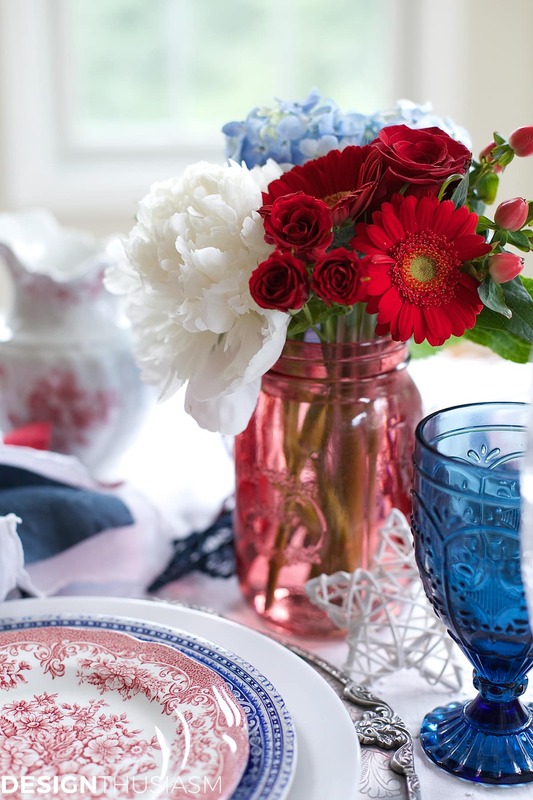 Gorgeous table and I love your pretty blog header too! Love those salad plates! You put a lot of thought into this and it shows! It’s very dramatic and so pretty! Ha ha! Probably more thought than a normal person should… lol. Thanks!! Lory, I don’t know how I forgot to leave a comment on this post – one of my all-time favorites! I have just ordered those salad plates. WS should link your post to those dishes! I love how you paired the salad plates with those chargers. What a great color match! I love the runner, the photos, the menus . . . The menus!!! Your design is fabulous! Really, this table is flawless! Don’t be surprised if you see me “borrowing” some of your ideas in the future. Thank you for sharing this marvelous table with us! Omg, Maria, thanks! What a fabulous comment!!! 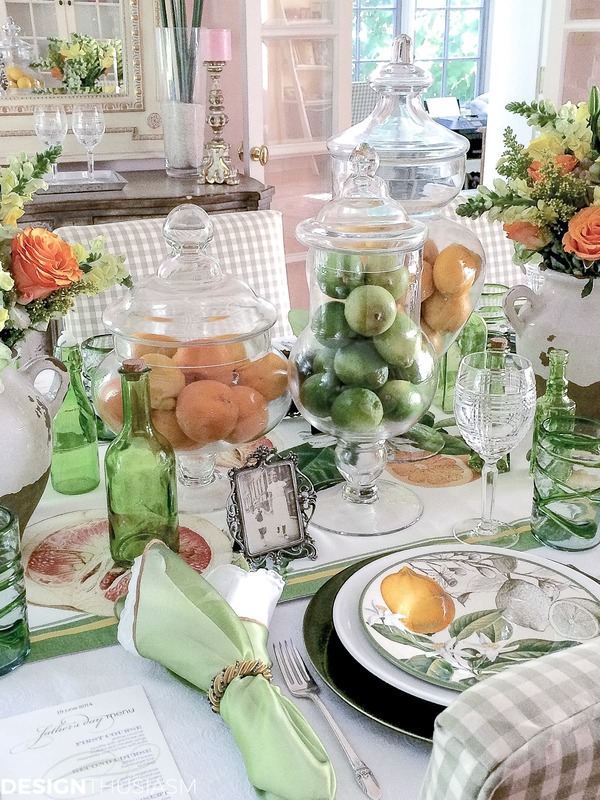 So inviting…love how the fruit, the flowers, and the green bottles all coordinate! Those plates are lovely! Thank you, Bev! I often start with a pattern (like these plates) and the rest pretty much comes together on its own… 🙂 So glad it resonated with you. Oh Lory your table setting is so bright and cheery. The color combination is one of my all time favorites. I adore the old photographs in the antique frames too. Your entire table is just breathtaking! Thank you so much, Barbara! I do enjoy a happy table and it’s wonderful when others appreciate it too… 🙂 Thanks for stopping by! What a gorgeous table! I love the old photographs with it! Thanks for sharing at Home Sweet Home! Refreshing and oh so beautiful!